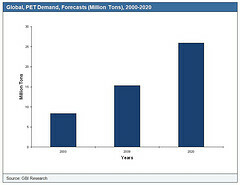 The global PET markets is expected to see new capacities as of the fourth quarter of 2013 as per ChemOrbis. These capacities include new plants, for which the start-up dates were delayed several times, as well as an idled plant which is set to resume operations after remaining offline for about a year. In Egypt, the Egyptian Indian Polyester Company, S.A.E (EIPET), delayed the start-up of their new PET plant located in Ain Sokhna, Egypt for a few more weeks to late December. The plant was still undergoing test runs at the end of November. EIPET’s plant consists of two lines, each of which has a capacity of 210,000 tons/year. Output from the plant was said to be directed to North America, North Africa and Europe. India’s Polyplex also delayed the start up of its new PET bottle plant in Corlu, Turkey to the end of this year from the middle of December. The company will commission their 600,000 tons/year PET plant in two phases. The first phase will bring 300,000 tons/year of capacity on-line while the remaining 300,000 tons/year capacity is slated for start up around 12-24 months after the completion of the first phase. Turkey’s Koksan started commercial deliveries from the first line of their new PET plant in Gaziantep, Turkey towards the end of November after completing trial runs that started earlier in the same month. The start-up of the plant, which consists of two lines each with a capacity of 216,000 tons/year, faced several delays since June this year. Turkey’s Polisan Holding is expected to restart their newly-acquired PET plant in Volos, Greece by the end of this year, according to market sources. The company acquired the plant from Artenius Hellas SA on September 17 with a deal worth 8.6 million euros. Sources said that the 80,000 tons/year PET plant has been idle since December 2012. According to local media reports, Polisan CEO Necmettin Bitlis said that they are currently negotiating with potential customers and added that there is a potential market for over 90% of the output from the plant. Saudi Arabia’s SABIC is planning to commission a new PET plant at Yanbu, Saudi Arabia in January 2014. The 420,000 tons/year plant was initially scheduled to come online by the end of the fourth quarter of 2013, but the start-up date was briefly postponed due to a delay in construction. The company is currently operating a 330,000 tons/year PET plant at Yanbu. Meanwhile, SABIC will also boost the capacities of their existing PX and PTA plants at the same complex. The PX plant’s capacity will be doubled to 400,000 tons/year and the capacity of the PTA plant will be raised from the current 350,000 tons/year to 600,000 tons/year. Brazil’s Petroquimica Suape is expected to achieve commercial production at their two new PET lines in Pernambuco, northeast Brazil by the end of January 2014. Each of the two lines will have a production capacity of 230,000 tons/year. According to ChemOrbis, Lotte UK is on track to start up a new PET plant in Teeside, the UK in the first quarter of 2014. The 200,000 tons/year plant, which is currently in the final stages of construction, was initially scheduled to come online in the third quarter of 2013. The company said that their decision to shutter their 500,000 tons/year PTA plant at Wilton due to poor market conditions will not affect the operations of the PET plant, adding that they plan to procure feedstock internally from their Asian subsidiaries.